As we shared in our last Off-Season Insights blog, Summer 2019 has a number of program updates as a result of the feedback from our parents, tzevet, and chalutzim. Year after year, we hear about the power of relationships our chalutzim develop while on their masa’ot, how important the friendships made each summer are, and the role our madrichim (counselors) play in being positive influencers. 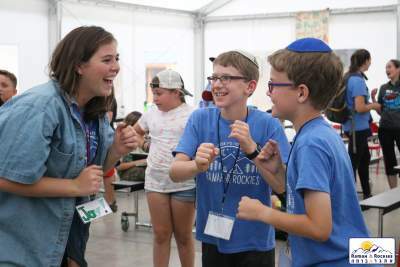 Yet, we also learn that some chalutzim occasionally struggle to develop these strong relationships with all the excitement and activity going on in base camp programs. Our addition of Ohel Koby last summer gave our chalutzim a new space in which to grow friendships. Whether over games of ping pong, foosball, or cards, campers engaged with each other and found ways to make connections both within and across all our edot. Continuing this trend, we are putting an additional emphasis this year on the relationships developed within our ohel and edah communities. A former member of our tzevet, Sky Yardeni, brought the idea of “radical tzchokim” (laughter) as an important tool in group bonding. In an effort to help facilitate radical tzchokim in all our edot, we are planning specific bonding programs for all this summer. These classic camp activities will give our campers the chance to bond through both laughter and silliness as edot and within their ohelim. Some of the activities our chalutzim will enjoy include tie dying, backcountry pizza making, carnival nights, and capture the flag! We hope these classic activities will complement the wonderful adventure experiences our chalutzim already have, while giving all a chance to relax and laugh at the end of the day. As with all our programs and activities at camp, we reflect on how these changes align with our core values of kavod (respect), simcha (joy), s’micha ishit (personal growth), and k’sharim (connections), and we hope these opportunities for edot to develop k’sharim through simcha will permeate through the whole camp experience. We look forward to seeing our chalutzim connect and laugh together and want to know, what activities do you want to see for edah and ohel bonding?